For years, we believe that Looker has been providing a great interface for querying your data. Today, Looker is excited to be releasing an improved interface. Ideal for editing charts, and creating beautiful visualizations, the new interface builds upon the existing platform to support more powerful features, previously unavailable to most users. For this update, we’ve made some improvements to help streamline your process. 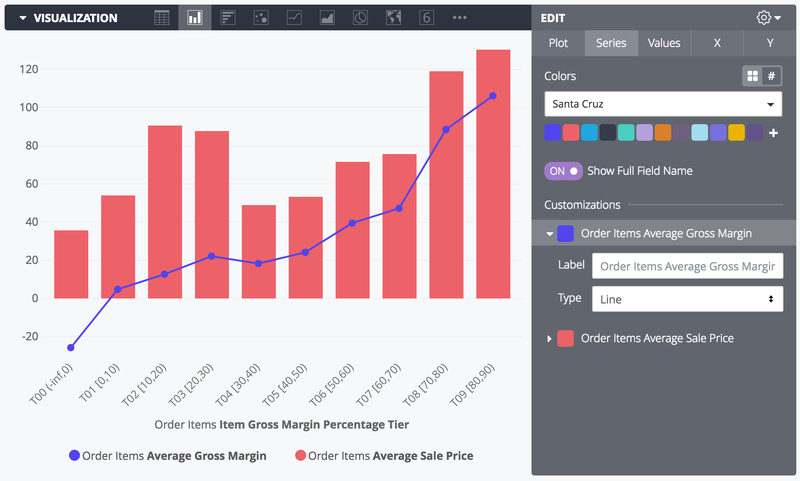 Column, Bar, Scatter, Line and Area charts now utilize a new Series tab, allowing easy configuration of series specific options, as well as an improved overall layout of visualization editor options. Series represent the groups of data which underpin a visualization. 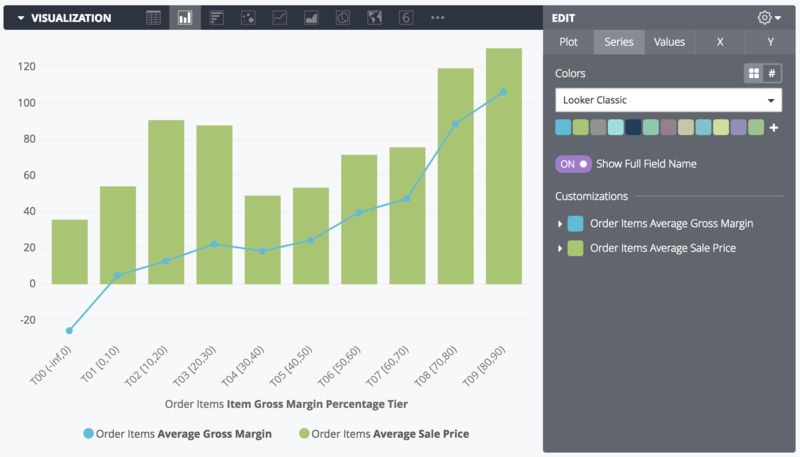 By focusing on configuring each series, we’ve improved the usability of the chart editor significantly, and exposed some powerful new functionality, providing more granular control around series’ colors, labels and layer types. You can still edit the overall color scheme for a chart using the color picker at the top of the Series tab, but now editing an individual series’ color is easier than ever. When changes are made - by either using the color palette picker or via a series’ individual color picker -the changes are immediately reflected in the Series tab and the chart. Updating a specific series’ label is now incredibly easy, even if that series is derived from a querying containing a complex pivot, such as a tiered field. You can also toggle the full field name for all the series that do not have a custom label applied by using the Show Full Field Name option. Finally, using a series’ Type picker, mixing chart types is now amazingly simple.. For example, you can easily create charts that mix column and line types, to better express the meaning in your data. These new improvements not only make editing a chart simpler and expose much richer functionality, they also provide a foundation for future visualization editing improvements. We’re passionate about expanding some of these interactional changes to other chart types, and committed to making Looker the best platform for exploring your data and using vibrant visualizations to tell the whole story..